Nearly two months before Barack Obama released what he claims is his valid Hawaii long-form birth certificate, a document met with accusations of fraud by experts, WND was warned by an intelligence source in contact with Hawaii officials that a forged version would be released. No story was published in WND, because the unnamed confidential source’s story could not be corroborated. The source warned in February that the long-form birth certificates issued to the Nordyke twins one day after Obama was born create a barrier for anyone attempting to create a fraudulent long-form, Kapi’olani-generated birth certificate for Obama. The Hawaiian source pointed out to WND the key to understanding why forging a Kapi’olani birth certificate posed problems for Obama lies in an analysis of the certificate numbers the Hawaii Department of Health issued to twin daughters born to Eleanor Nordyke at the Kapi’olani Maternity and Gynecological Hospital on Aug. 5, 1961, one day after Obama was supposedly born at the facility. The source warned that Obama supporters in Hawaii were contemplating the release of fraudulent Obama birth records in the run-up to the 2012 presidential elections. The source further warned that the document fraud being contemplated would be sufficiently expert that it could only be detected by forensic examination of the originals, not digitized copies or photographs circulated out on the Internet. The White House has not released originals for examination. As WND reported in July 2009, a close examination of the long-form birth certificates issued by Kapi’olani to the Nordyke twins further confirms that the number sequence precedes the registration number given President Obama, even though President Obama was born supposedly at the same hospital a day earlier than the Nordyke Twins. Susan Nordyke, the first twin, was born at 2:12 p.m. local time and was given File No. 151 – 61 – 10637, which was filed with the Hawaii Registrar on Aug. 11, 1961. Gretchen Nordyke, the second twin, was born at 2:17 p.m. and was given File No. 151 – 61 – 10638, which was also filed with the Hawaii Registrar on Aug. 11, 1961. Yet, according to the short-form birth record released by FactCheck.org during the 2008 presidential campaign, Barack Obama was given a higher number than the Nordyke twins, File Number 151 – 1961 – 10641, even though he was born on Aug. 4, 1961, the day before the Nordyke twins, and his birth was registered with the Hawaii Department of Health registrar three days earlier, on Aug. 8, 1961. Any long-form, Kapi’olani Hospital-generated birth certificate for Obama carrying the certificate number displayed on the FactCheck.org certification of live birth would be an obvious forgery, the source said, because, if Obama had been born on Aug. 4, 1961, as claimed, the certificate number of his long-form, Kapi’olani Hospital-generated birth certificate would have carried a number preceding the certificate numbers on the authentic Nordyke twin birth certificates. 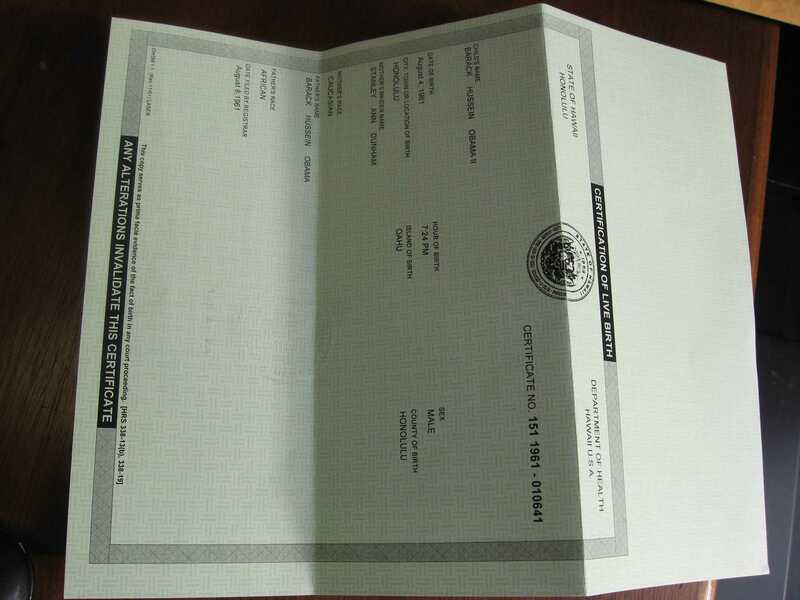 Yet, if a forger were to release a long-form, Kapi’olani Hospital-generated birth certificate with a number earlier in sequence to the certificate numbers for the Kapi’olani twins, the source contended, that would prove the FactCheck.org certification of live birth was a fraud, as has been widely speculated since the document first appeared on the Internet. Zatkovich, with 28 years experience in computer science and document management and 10 years of providing expert testimony in federal court, said the multiple PDF document layers are unusual. “When a paper document is scanned on a scanner and saved as a PDF file it normally contains only a single layer of graphical information. The PDF that appears on the White House website however, contains multiple layers of graphic information. Multiple layers usually appear in a document like this when it is being edited or modified in some fashion,” his report said. Also, the main layer of text contains most of the wording on the document, with strange exceptions such as the first part of Stanley Ann Dunham Obama’s signature. Karl Denninger, the former CEO of MCSNet, a Chicago networking and Internet company, says the presence of “kerning” in the text confirms manipulation. Kerning is the squeezing of letters into a line so that they intrude into adjacent letter spaces. It has become routine since the advent of word processors and computers but is impossible with a typewriter. A YouTube contributor posted a video that claimed the White House either was ignorant in posting the document or was submarined by someone inside its walls who wanted people to suspect the document. However, the document released by the White House was entirely typed, except for signatures and two dates. What Fukino described is apparently a different document from what Obama released to the public. The objectivity of “experts” cited by the mainstream media to verify the birth certificate is suspect, including that of Fox News Channel’s Jean-Claude Tremblay, who assured Americans they “should not be suspicious” of the document. But WND discovered Tremblay had heralded Obama’s election victory in an online post. Obama’s purported birth certificate contains over a dozen differences in form from the verified Hawaii copy of the birth certificate issued to the Nordyke twins, born the next day at the same reported hospital. There are Obama critics, too, who say that the document released by the White House, if authentic, proves Obama’s ineligibility. They cite the indication that Barack Obama Sr. was listed as the father but he never was a U.S. citizen. They contend those who wrote the requirement for presidents to be a “natural born citizen” disqualified dual citizens at birth, such as Obama. Obama himself even seemed to hold that position, suggesting in a resolution he co-sponsored to address Sen. John McCain’s status as a “natural born Citizen” that the status requires “American citizen” parents.